The collision happened at the intersection of Hamilton and West Georgia streets just before 9 a.m. PT. A man has been arrested after at least one pedestrian was hit by a stolen vehicle in downtown Vancouver on Friday. Police said the car was stolen from the parking lot at Cambie and Pender streets around 8:40 a.m. PT. The suspect then drove to the intersection of Hamilton and West Georgia streets, where he hit a pedestrian and several parked cars around 9 a.m. PT, police said in a statement. The 27-year-old man fled on foot, pepper-spraying several witnesses, before he was tackled by construction supervisor Ben Smith. Smith, who had been working with Pacific Blasting and Demolition at the Canada Post site on West Georgia Street, saw the collision from the worksite. 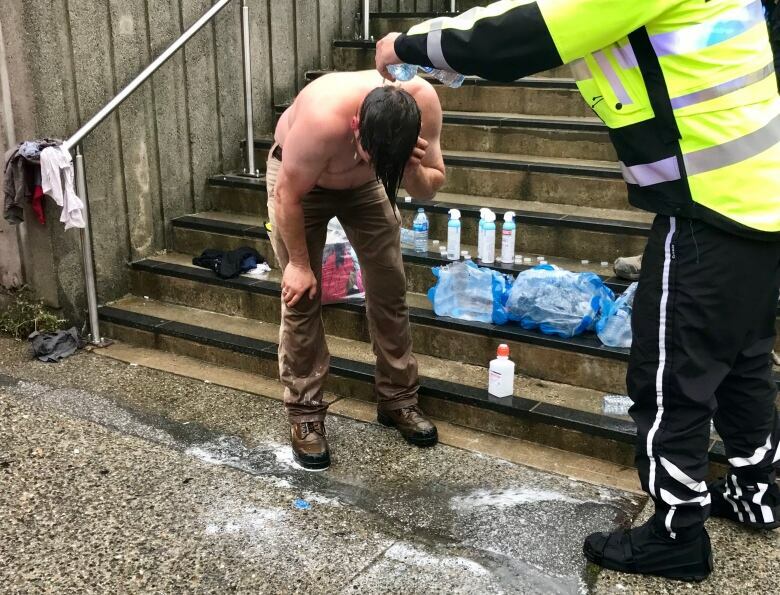 He chased the man and was pepper-sprayed in the face before holding the suspect down outside the Queen Elizabeth Theatre on Cambie Street. Police arrived soon after and the man was arrested. The pedestrian who was hit was taken to hospital with serious but non-life threatening injuries. Muhsin Al-Maamiry says he was parking his van on Hamilton Street when he saw a black SUV speeding down the road. He said the vehicle hit other parked cars before the driver got out and ran toward the theatre. "We yelled at him to stop but he kept going," Al-Maamiry said. Al-Maamiry​ says he and several other witnesses were pepper-sprayed. Craig Vandermeer, the owner of the vehicle that was stolen, said the suspect was "extremely aggressive." "Once he got into the car that's when I started panicking because a car is a very deadly weapon," he said. "It's surreal when something like this happen to you. This kind of thing doesn't happen in Vancouver." Vancouver police officers on scene confirmed the black SUV had been stolen. The collisions happened outside the CBC Vancouver building as several reporters were on their way into the newsroom. An earlier version of this story misidentified Smith as a city worker.